Schick Win Gadgets and Trip ~ Philippine Freebies, Promos, Contests and MORE! 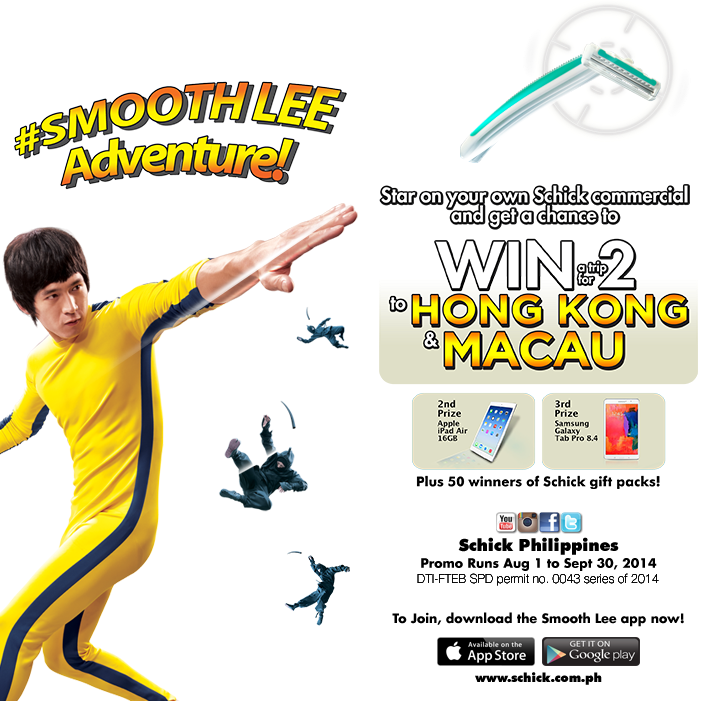 Time to star on your own commercial and get a chance to win gadgets and a trip in Schick's Smooth Lee Adventure Promo. All you have to do is download the FREE Smooth Lee Adventure mobile app in Google Play or App Store. Using the mobile app, create your own Smooth Lee commercial. Submit it using the app then register with your contact details on the Schick FB page. Wait for your entry to be uploaded. Encourage your friends to vote for more chances of winning a trip for 2 to Hong Kong inclusive of round trip airfare, 3-star hotel accommodations, Hong Kong and Macau city tour, Disneyland and Ocean Adventure passes, and USD500 pocket money (1st Prize), Apple iPad Air 16GB (2nd Prize), or Samsung Galaxy Tab Pro 8.4 (3rd Prize). Schick gift packs will also be handed to weekly draw winners.